Reference number for this case: 19-oct-54-Ygrande. Thank you for including this reference number in any correspondence with me regarding this case. "We are told that the teacher of Ygrande, Mr. Gustave Rivet, was walking in the countryside around 3 p.m. accompanied by his young class including 19 students, for the explained botanical lesson. "At the moment when they were about to arrive at the place called "Les Deux Passages" their attention was attracted by an unusual noise. "A light, alternating whistling sound whirled through the air in the sunny, windless countryside, and the concerned children asked their master what it was, and he was unable to answer them. The noise stopped suddenly. "Forgetting this incident, the young class continued its studious walk. "About half an hour later, the noise was heard again, and it was the surprise of the whole class to discover that the sound was coming from the middle of a field hidden by a curtain of trees. "A machine was there whose metallic appearance of a dark red made them immediately think of a flying saucer. This instrument consists of two parts, the lower part about 1m to 1m.50 high, spherical and with ovals portholes, the upper second part appearing to be a disc of about 0.50 m of thickness rotating and emitting a slight hum, rested on square blocks. "Monsieur Gustave Rivet was able, at his leisure and with a calm mind, to observe this strange vision. Around the device, there were three forms that seemed to be the passengers of this machine. These forms were composed of an almost normal human trunks with two arms whose proportions were human, but terminated by an opening and closing hook. "A single leg ended in a spherical base made it possible to move in small jumps. The very small and conical heads seemed to have three eyes located in a triangle and allowing vision in all directions at the same time. "The most curious thing is their suit, which seems to be a leather jacket, of a steel-gray color. The young Chatelin, 14-year-old, son of Ygrande's garment shop, certifies to have recognized a "Duracuir" jacket of the kind that dresses up Louison Bobet, the world champion, always chic and well dressed!" 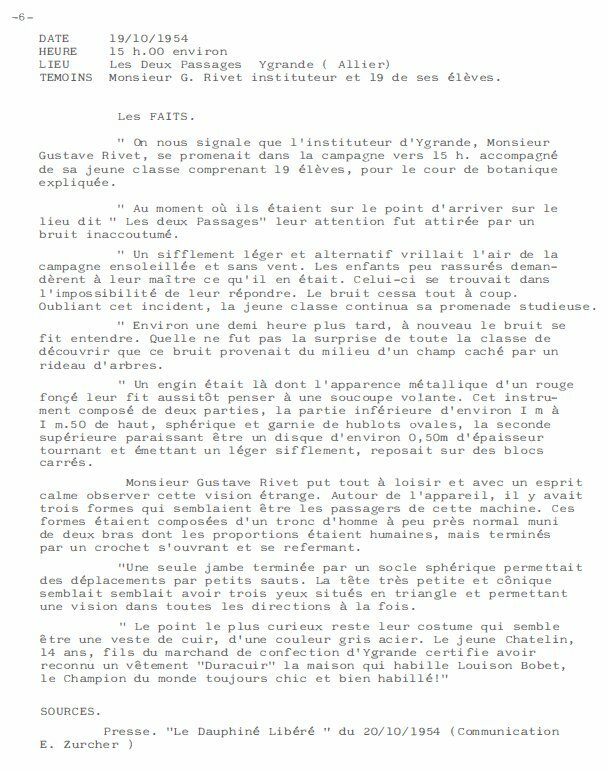 The press text was apparently found by ufologist Alain Gamard, it apparently appeard then in a book by ufologist Eric Zurcher, then, ufologist Jean Giraud chcked into it and said that there was never any Gustave Rivet teacher in Ygrande, never any Chatelin fashion shop in Ygrande, and no place called "Les Deux Passages" appears on an army map. WITNESSES Mr. G. Rivet, teacher and 19 of his students. "The most curious thing is their suit, which seems to be a leather jacket, of a steel-gray color. The young Chatelin, 14-year-old, son of Ygrande's garment shop, certifies to have recognized a "Duracuir" jacket of the kind that dresses up Louison Bobet, the world champion, always chic and well dressed! " There has never been any Gustave Rivet teacher at Ygrande. There has never been any Chatelin fashion merchant in Ygrande. The Amry map does not mention any place called "Les Deux Passages". "A luminous sphere rose vertically and disappeared quickly." This is the only case ever reported on Ygrande commune, but just two months after the alleged landing in D.L. "We are informed that the school teacher of Ygrande, Gustave Rivet, walked in the countryside at approximately 03:00 p.m., accompanied his young class of 19 pupils for the course of practical botany." "At the time when they were on the verge of arriving at the location called "les Deux Passages", their attention was caught by an uncommon noise. A light and alternative whistle resounded in the air of the sunny and windless countryside. The children, not reassured, asked their teacher what it was. The latter was unable to answer. The noise ceased suddenly. Forgetting this incident, the young class continued their studious walk. Approximately half an hour later, again the noise was heard and how amazed was the class when they discovered that this noise came from the middle of the field hidden by a curtain of trees." "An apparatus whose metallic appearance of a dark red, made them at once think of a flying saucer. This apparatus had two parts, the lower part of approximately one meter to of one meter fifty, spherical and equipped with oval port-holes; the second, higher part, appearing to be a disc of approximately 0,50 meters thickness, rotating and emitting a soft whistling sound, rested on square blocks." "Mr Gustave Rivet could observe this strange vision at length and with a cool spirit. Around the apparatus there were three shapes that seemed to be the passengers of this machine. These shapes were made of a trunk like that of a normal man provided with two arms of which the proportions were human but ended by hooks which were opening and closing again. They had only one leg ending in a spherical base which allowed their displacements by small hops. The head, very small and conical, seemed to have three eyes located in triangle and allowing to see in all the directions at the same time." "The most curious feature was their costume which seemed to be a leather jacket of a gray steel color. 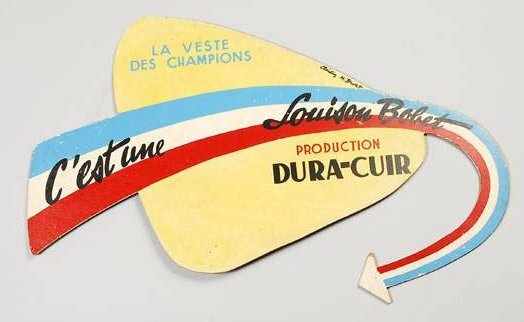 The young Chatelin kid, aged 14, son of the clothes merchant of Ygrande, certifies to have recognized a "Duracuir" clothing, that brand which dressed Louison Bobet, the classy world champion, always nicely dressed...!!!" The two authors indicate that if the ufologists had humor instead of being stupid because of their fanaticism they would laugh when reading this. They then say that this affair can be "eliminated without any doubt." They tell then that they made an in-depth investigation into this case, by letters and telephone calls and "several working days to be sure that we do not make an error of judgment." 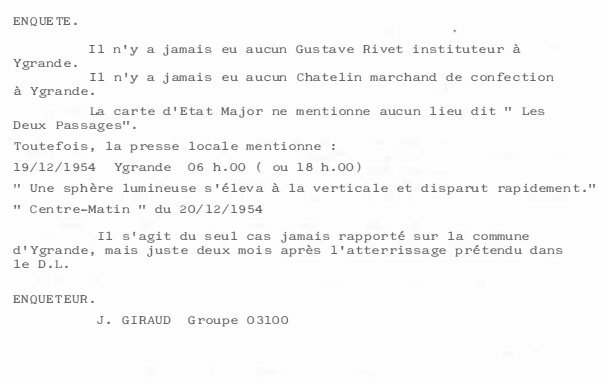 They then say then that it is a hoax and that Mr. Rivet and the young Chatelin kid did not exist but that "in the other sightings the nature of the report does not always make it possible to suspect a possible joke." Advertising for "Duracuir" clothes. Investigation by J.M. Giraud. Eric Zuercher p. 138. Teacher Gustav Rivet and 19 schoolboys were going for a botany ramble in the country, when at "les deux passages" they heard a slight whistling that suddenly stopped. 30 minutes later they heard the same noise and saw a deep red coloured metallic object. It comprised of a spherical lower part, 1.5m diameter, with oval portholes, surmounted by a rotating disc 50cm thick, which gave off the sound. It stood on square blocks. Around the object were three figures with humanoid trunks, but only one leg that terminated in a spherical stand. They had hook like hands and small conical heads with three eyes in a triangle. They wore leather jackets. Alain Gamard citing Le Dauphine Libre [sic] 20 October 1954. The teacher of Ygrande, M. Gustave Rivet, was walking in the countryside accompanied by his young class of 19 students for the botany lesson. When they arrived at the place called "Les Deux Passages", their attention was attracted by an unusual noise, a slight and alternate whistling sound. The noise ceased suddenly. Half an hour later, the sound was heard again and the whole class discovered its origin: in the middle of a field a machine of metallic appearance, dark red, composed of two parts, a lower part of about 1 m to 1.50 m height, spherical and lined with oval portholes; a discoidal upper part about 0.50 m thick, rotating and emitting a slight whistling sound, resting on square blocks. Around the apparatus there were three forms, each composed of a man's trunk, almost normal, with two arms of human proportions, but terminated by a hook opening and closing. A single leg terminated by a spherical base allowed them to move in small jumps. The head, very small and conical, seemed to have three eyes located in a triangle allowing vision in all directions at once. The young Chatelain, aged 14, the son of a garment-maker in Ygrande, had certified that he had recognized in the costume of the entities which appeared to be a steel-gray leather jacket, a "Duracuir" garment, such as worn by Louison Bobet, the world champion, always chic and well dressed! Sources are indicated as Le Dauphiné Libéré for October 20, 1954. Julien Gonzalez notes that after counter-investigating, Mr. Jean Giraud concluded that there was never any Gustave Rivet teacher in Ygrande; tThat there has never been any Chatelain, clothing merchant in Ygrande, and that no place called "Les Deux Passages" exists in the commune of Ygrande. The source for this explanation is given as INFO-UFO special issue "Catalog of landings in Auvergne". As a ufologist, therefore "stupid" and "without humor" by definition if I am to believe Gerard Barthel and Jacques Brucker, I did laugh, but at the expense of Jacques Barthel and Gerard Brucker rather than at the expense of the ufologists. Indeed, it is enough to read the last paragraph of the newspaper text that they reproduce to understand that this is simply advertising for the Duracuir clothing brand, presented in the form of a Martian landing story, such advertising scheme having become frequent at the time. It seems that Gerard Barthel and Jacques Brucker take people for granted when they claim that they made an in-depth investigation for "several working days." First, there was no risk of "error of judgment" in discarding this story: a Duracuir jacket, the elegant champion cyclist Louison Bobet! Second, there was not the least reason to insult people who would be "without humour", "fanatics" and "stupid". This case, when it appears in the ufology literature, is obviously not presented to make a case for the flying saucer! The only mention of this case that I found is that of Michel Figuet who clearly indicates: "advertising for Duracuir clothing." As for Gustave Rivet "who does not exist", he was actually a republican politician deceased for a long time, who had had functions in public education, principal private secretary of the Secretary of State to the State Education in 1879, his name was given to a certain number of places and streets of France, possibly providing inspiration to the author of the publicity. 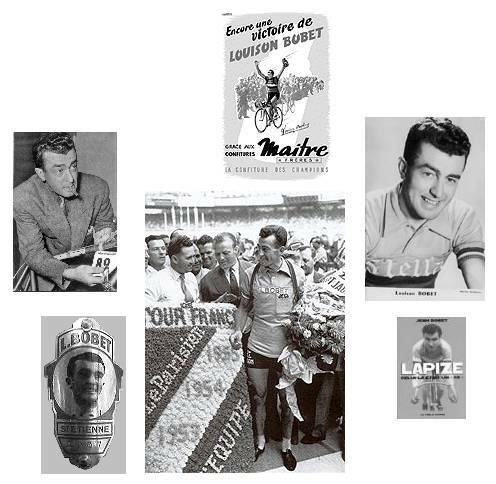 As for the bicycle champion Louison Bobet, victorious of the Tour France three consecutive times in 1953, 1954 and 1955, he was indeed an elegant man, he also was really the first French sportsman who had been solicited by advertisers. [---] Advertising in the regional newspaper Le Dauphiné Libéré, France, October 20, 1954. [io1] Case record in the ufology magazine Info OVNI, France, special issue "Catalogue d'Observations Atterrissages en Auvergne", pp 6-7, not dated, the 1970's. [bb1] "La Grande Peur Martienne", book by Gerard Barthel and Jacques Brucker, Les Nouvelles Editions Rationalistes éditeurs, France, pp 50-51, 1979. [mf2] "Catalogue Francat des Rencontres Rapprochées en France - Listing 800", catalogue by Michel Figuet, in the ufology magazine Lumières Dans La Nuit (LDLN), France, #265-266, page 19, July / August 1986. [gz1] "RR3 - Le Dossier des Rencontres du Troisième Type en France", book by Julien Gonzalez, Le Temps Présent publishers, France, page 440, 2014. 1.1 Patrick Gross August 14, 2013 Addition [pr2]. 1.2 Patrick Gross February 17, 2017 Addition [gz1]. 1.3 Patrick Gross January 11, 2019 Additions [io1], [mf1], Summary. In the Explanations, additions of "Finally, here is the advertizing panel..." and the image below.